We have collected and analyzed 39 expert reviews and 1603 user reviews from international sources. Experts rate this product 78/100 and users rate it 85/100. The average review date is Feb 17, 2014. We have compared these reviews to 707516 reviews from other Tablet Computers. The alaScore™ for this product is 89/100 = Very good. Last update: Apr 19, 2019.
alaTest has collected and analyzed 26 user reviews of Asus Memo Pad FHD10 from Amazon.co.uk. The average user rating for this product is 3.9/5, compared to an average user rating of 4.3/5 for other products in the same category on Amazon.co.uk. alaTest has collected and analyzed 472 user reviews of Asus Memo Pad FHD10 from Amazon.com. The average user rating for this product is 4.2/5, compared to an average user rating of 4.1/5 for other products in the same category on Amazon.com. The ASUS MeMO Pad FHD 10 is a solid tablet overall, and removable storage and a micro-HDMI port give it some nice benefits over more expensive competitors. However, its performance in some graphically intense games is poor. The 10-inch tablet starts at $329 and dons a lightweight, comfortable design, as well as a sharp 1,920x1,200-pixel-resolution IPS screen. The ; boasts a comfortable build, sharp screen with good viewing angles, and starts at a reasonable $329. Included Asus software significantly enhances multimedia experiences and the floating dock feature makes multitasking quick and easy. The ASUS MeMO Pad FHD 10 is powered by a 1.6GHz Intel Atom Z2560 processor, has 2GB RAM and comes with 32GB of internal memory. A microSD card slot allows users to expand the storage. 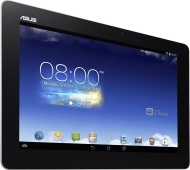 The ASUS MeMo Pad FHD 10 is a competitively priced, 10in Android tablet with a full HD screen and an Intel Atom processor. "Started Great. Would NOT buy again."